January Meeting Tonight at 8pm! Our next meeting will be Wednesday January 3rd at 8pm. All members are welcome to attend. Happy New Year! Our first meeting of 2018 will be Wednesday January 3rd at 8pm. 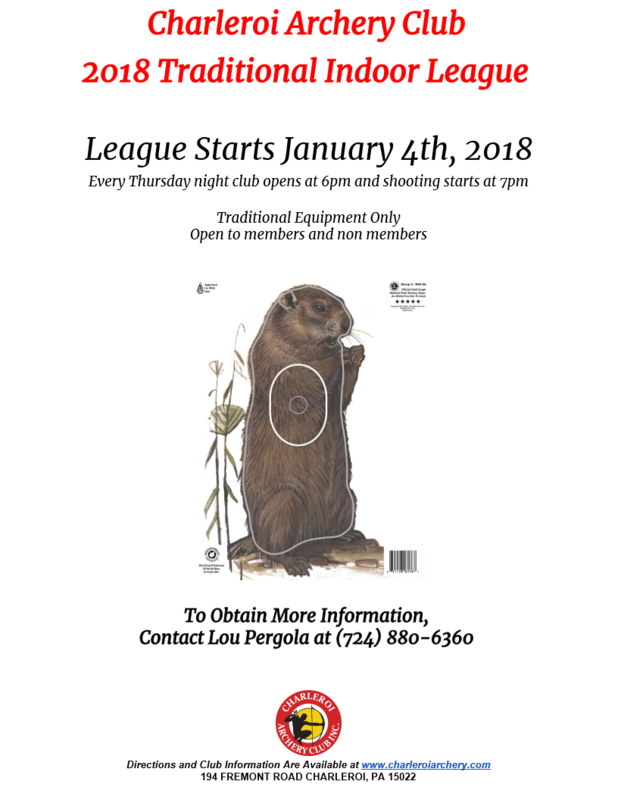 Also, Trad League begins Thursday January 4th at 7pm. We are trying to make the trad league a bit competitive this year. First rule is to have fun as it always has and hopefully always will be. Tracking the scores, handicaps, and all of the other stuff is going to be taken care of behind the scenes. If you do not want to compete and just shoot your bow, you are welcome to do that. We are looking to make this fun and interesting, not miserable or complicated. Teams of three will be chosen randomly from those who sign up. Awards for highest team score, highest net score individual, highest gross score individual will be presented at the conclusion of the league. Handicaps will be calculated after week 2 scores are reported and recalculated on the first Thursday of the month. Archers do not need to calculate their own handicaps. Handicaps will be 80% of the difference between 660 and the average of previous calendar month’s scores after dropping lowest score. If only one score is available, it is 70% of the difference between 660 and that score. The first two weeks (Jan 4th and 11th, 2018) will be used for determining initial handicap and not counted toward scoring. Makeups must be completed at Charleroi Archery Club from the same distance positions of that week. Makeups must be completed and reported before next league night. In the event only two members from a team shoot, those two scores are counted for the team. If one member of a team shoots, 90% of the lowest net score of the week of all shooters is used for the second score. If no members of a team shoot, it is 1.8 times the lowest net score of the week. In the event one or two teams have only two members assigned, the third score will be the average net score for that week. Reassignment of teams will be considered if deemed necessary or proper following the spirit of friendly competition and common sense. The high individual net and gross scores will be determined by the sum of all weeks. A missed week without makeup will be counted as zero. If you read this far and still have questions, ask Jonathan Fasson. 2018 Dues Due by December 31st! 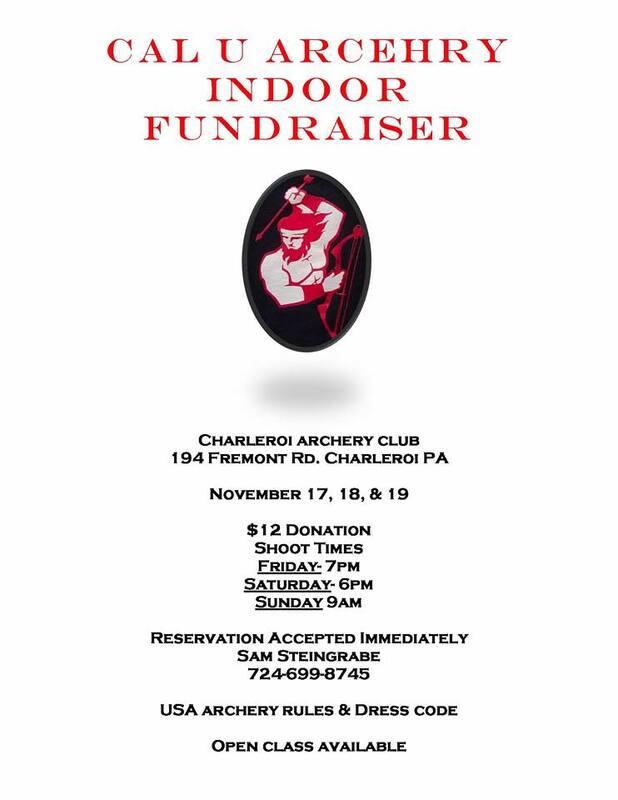 This year is quickly coming to an end and I’d like to take the time to remind everyone that the 2018 dues for Charleroi Archery Club are due by December 31st 2017. Dues paid past December 31st will be assed a $10.00 late fee so don’t miss out! Dues can be paid by stopping by the club and filling out the dues renewal form that is hanging on the bulletin board and dropping your fee in the dues drop. Tonight would be a prefect night to stop down to the club since it’s meeting night. Meeting will start at 8:00pm. Dues can also be mailed to the club by going to the website and printing out the dues renewal form here( Charleroi Archery Dues Renewal Form ) and mailing them to Charleroi Archery Club, 194 Fremont Rd, Charleroi, PA 15022. All new members will pay a one-time Initiation Fee of $10.00. Only one Initiation fee of $10.00 is required per household. Our next meeting will be Wednesday December 6th at 8pm. All members are welcome to attend. 1st Indoor shot of the season. Cal U Indoor Shoot! We will be having our monthly meeting Wednesday November 1st, 2017 at 8pm. All members are welcome. We hope everyone is having a safe and fun archery season! We will have our monthly meeting at 8pm on Wednesday night for any members who wish to attend.